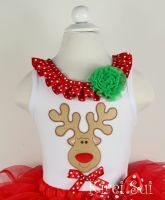 This Reindeer sleeveless tee is so cute with its lovely embelishments. Babies, Toddlers and Kids love this Christmas tee as the reindeer has a fuzzy feel, it has a lovely spotty bow and matching neck ruffle. It is certainly something special.